While waiting for inspiration for other projects I have made a series of belt buckles. These are for a 1 1/2" belt, like what is used for jeans. 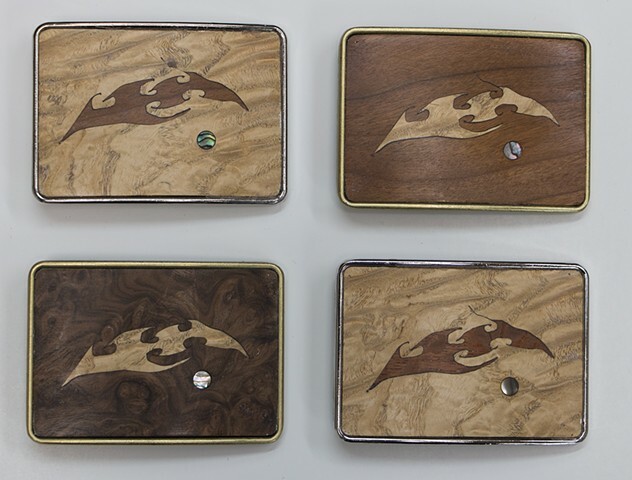 The buckles consist of a metal blank, either silver or brass colored, with wood marquetry placed into the blank. Various kinds of wood as well as abalone shell or mother of pearl inlays create the design. Depicted here are examples - more designs to come!